eAmber Allen's passion for postpartum work began after the birth of her daughter in 2011, when she struggled with postpartum depression. She found it difficult to cope while caring for a newborn and also caring for herself, physically and emotionally, in a new city where she knew few people. Through that experience she discovered her desire to empower mothers through the first few weeks and months of their child's life. Amber's goals when working with clients are to make sure the mother is well-nourished and nurtured, her partner is educated, siblings are occupied, the home is clean, pets are looked after and the baby is content. Amber is also a yoga teacher with 500 hours of training, with her focus primarily on the prenatal and postpartum period. 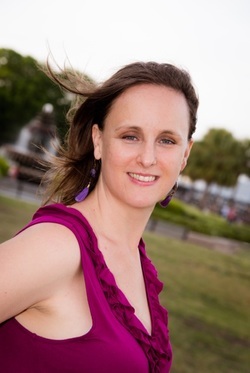 She currently teaches Mommy/Daddy and Me Yoga at Charleston Community Yoga and Prenatal Yoga at Charleston Birth Place. Amber is married with two children: a daughter and a son, and one dog. When she is not teaching yoga or doing postpartum work, Amber is a birth choice advocate in South Carolina and a writer/editor/blogger. She also enjoys cooking, gardening, paddle-boarding, photography and riding her bike. Amber is currently serving as the Secretary of the PDC.